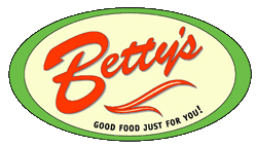 Opening in October, 2004, Betty's quickly won the hearts and loyalty of Buffalonians with its cheerful, sunny dining room, its friendly and funky staff, and its moderately priced eclectic cuisine. Betty's food is simple, fresh, and creative, drawing on American and international influences, resulting in food that is wholesome, interesting, and unpretentious. Betty's aspires to use food as a vehicle for bringing people together in ways that result in good feelings, good will, and a heightened sense of community in Buffalo, NY. Tuesday - Friday 8:00 a.m. - 3:00 p.m.
Tuesday - Friday 11:00 a.m. - 3:00 p.m.
Tuesday - Saturday 5:00 - 9:00 p.m.
​Saturday 9:00 a.m. - 3:00 p.m.
​Sunday 9:00 a.m. - 2:00 p.m.